The Polystyrene Association of South Africa unveiled exciting plans to increase the collection and recycling rate of post-consumer polystyrene at its Annual General Meeting held in Midrand recently. ‘We have had phenomenal success with our various recycling projects over the last 11 years. During the 2017-2018 financial year, more than 6300 tons of polystyrene were successfully diverted from our country’s landfills. When considering how light polystyrene weighs (it consists of 94 per cent air) and that our recycling figures in 2013 stood at 1849 tons, this is truly an achievement of which we are incredibly proud,’ Polystyrene Association CEO, Adri Spangenberg, announced. Although various end-markets have been developed for recycled polystyrene, such as used in the production of picture frames, cornices and stationery, the biggest success has undoubtedly been achieved using recycled polystyrene in lightweight concrete solutions. Polystyrene used in this application can be of any colour or grade, clean or slightly contaminated as it gets chopped up and mixed with a special mixture of cement and other ingredients to form lightweight concrete that is waterproof, fire resistant, offers insulation against heat and cold and it is cheaper and easier to build with than traditional bricks or concrete. According to Adri, one of the biggest stumbling blocks that has been identified in the recycling supply chain, has been the challenge of getting the polystyrene out of the waste stream and to the recyclers in time and on a consistent basis. ‘There is a substantial (and growing) demand for the recycled material in South Africa and an abundant supply of polystyrene packaging material that can be recycled. However, the industry has been experiencing bottlenecks in various areas of this supply chain. A desperate need for material has necessitated the industry to address the logistical issues that are hampering the recycling of polystyrene. Much of our focus, energy and attention this past year has been on developing a workable, financially viable solution which we submitted to Government as part of our Industry Waste Management Plan,’ Adri explained. The first step to address the logistics challenges of recycling polystyrene will be taken through the forming of Trading Hub Clusters (THCs) which represent all relevant industries in the value chain. ‘This is a centralised operation which streamlines the entire process by bringing polystyrene recycling under one roof within a geographical area, thereby relieving the pressure on waste management companies and government. In effect, we as an industry are driving the implementation of a feasible business, taking responsibility for polystyrene earmarked for recycling into an BEE entrepreneur managed operation,’ Adri explained. Initial plans are to establish three major Trading Hub Clusters in major metropoles, i.e. the Western Cape, Gauteng and KwaZulu-Natal. The core focus of these clusters will be on facilitating the recycling of polystyrene in these provinces and ensuring a constant supply of materials for use in décor market (cornices, picture frames), building market (lightweight concrete bricks and screed), beads market (hobbies and crafts), and the Polystyrene Association’s Breadtags for Wheelchairs and Tutu Desk projects. ‘Although sales volumes will be determined by the capacity of the trading hub, it is estimated that the initial output to per HUB to be around 50 tons per month. The current demand, however, already outstrips this figure and this number must be increased as a matter of urgency,’ Adri explained. The second initiative that was developed this past year, is small-scale municipal polystyrene recycling hub (MPRH) facilities for the small to medium-sized municipalities situated in outlying areas of South Africa. Each Municipal Polystyrene Recycling Hub will integrate the collection and recycling of polystyrene into a usable form. Lightweight cement blocks and screed will be manufactured on-site, which will be used to build houses and clinics in each district. ‘The lack of affordable housing and the need to create employment for communities are two of the biggest socio-economic needs facing South Africa today. Combined with South Africa’s mounting waste crisis and need for proper waste infrastructure that needs to be developed, local municipalities are facing a great challenge. However, we believe these recycling hubs will play an important role in growing the polystyrene recycling value chain and will provide much needed job creation, transformation and recycling initiatives on a community level. In effect, it will bring the solution of polystyrene recycling to the people at grass roots level and will empower them to improve their living standards and quality of life by being able to produce the material needed to address the housing crisis in their immediate area,’ she expanded. Plans to implement these innovative recycling hubs are already underway. The Polystyrene Association has already met with selected municipalities to test and discuss the implementation of pilot projects. ‘We will be launching our first pilot of a Polystyrene Recycling Hub in partnership with the George Municipality in the Southern Cape later this year. Land for the project has already been earmarked and discussions are well underway to get the recycling hub off the ground as soon as possible,’ Adri revealed. She added that various other municipalities are also showing a keen interest, including the City of Cape Town and Drakenstein Municipality. 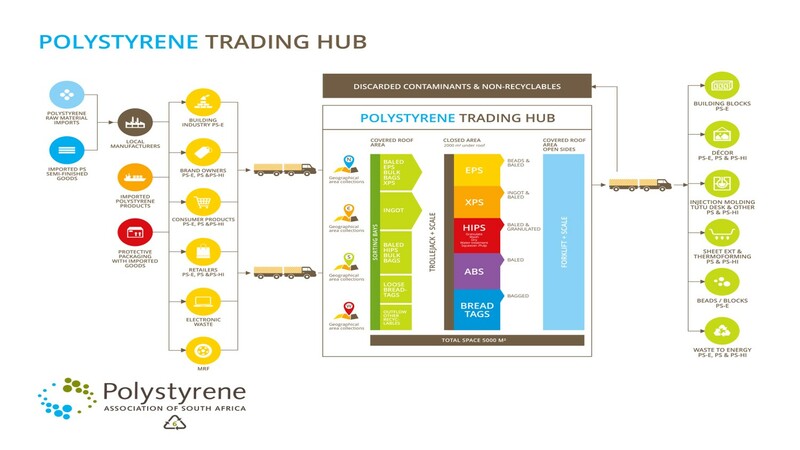 ‘These projects will enable us to increase polystyrene recycling in South Africa to 63.7 per cent (27 870 tons) per annum by 2023 as the entire process is streamlined and centralised under one roof within a geographical area. Because the local community will be responsible for collecting and sorting the polystyrene, various primary and secondary jobs will be created, while at the same time also raising awareness of polystyrene recycling. ‘Our industry is excited and supported of the project, because it allows them to demonstrate their commitment towards environment and our country’s sustainable economic development through job creation, technological advancement and sustainable economic growth,’ Adri concluded.